Lovingly hand-made and tested in Harlow, England. This two channel equaliser had been designed to be as much at home in tracking individual instruments or sitting across a stereo mix buss to equalise the final mix. As with other units of ours, such as The Phoenix, all controls are clearly labelled and setting up the eq is quick and easy, so we named it after Britain’s fastest bird in level flight. 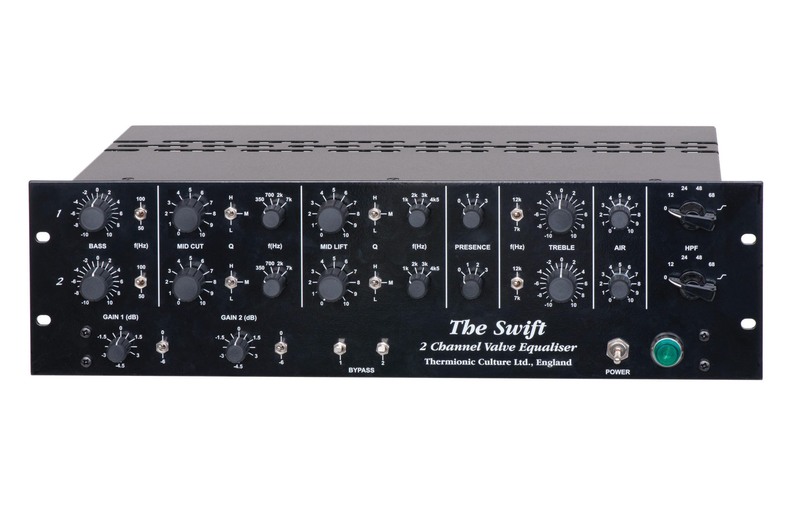 THE SWIFT utilises influences of 2 classic designs of the “golden days” of all valve recording with improvements to bring the specs up-to-date for today’s pro use, plus added features of our own designs. The main electronics are based around a 1950s EMI desk but with extended top and bass response. It had a BAXANDALL type active eq which we’ve kept and we added a Presence switch to give a broad band lift to mid/hi frequencies. This is based on one invented by Vic Keary in 1963 and used in his own mixing desks. The mid lift controls are based on the Pultec design and are passive. For speedy operation and economy we have chosen just 4 frequencies, with 3 “Q” settings. Special features of ours are Hi Pass Filter, Mid Cut and “Air” (all passive). An interesting (Pultec type) effect can be obtained by setting the High Pass Filter at its last setting which combines a shelving bass cut with a filter at very low frequency, then using plenty of bass lift at either 50 or 100 Hz. All pots are continuously variable. We have chosen not to use indented ones for subtlety and reliability reasons. Gain is on switches, for comparison purposes. BYPASS switch disconnects the electronics so you hear the unadulterated original signal. No metering is provided as it was deemed to be just a distraction. 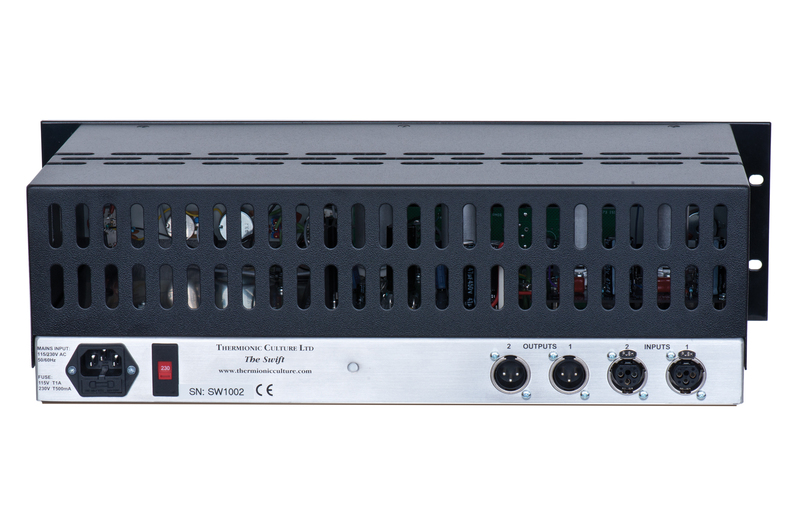 The Swift can output + 20 dBu without noticeable distortion and it’s practically noiseless. 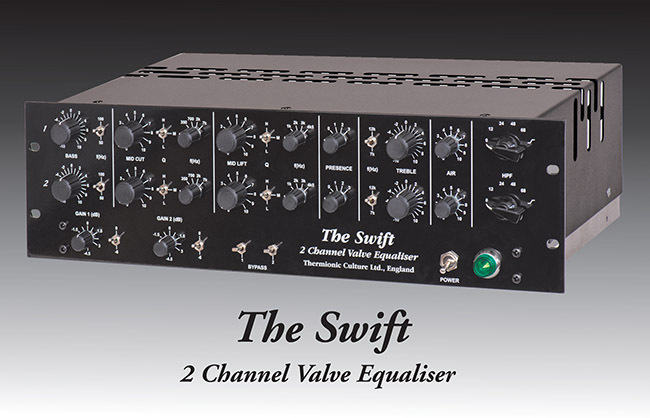 Although The Swift is influenced by old designs, our electronic design is a great improvement on the old ones. There are only two valves per channel to keep colouration minimal. We use modern, specially designed, Sowter transformers and valves (tubes) not used before in this type of circuit. They simply sound better and the technical spec is outstanding. In all fairness to the original designers, these valves were probably not then available at the design stage so this gives us a little advantage!